Learn how to use PLR content to grow your blog. Customize blog outsourcing and earn more from affiliate sales, social media content, and email conversions. There are times when I recommend PLR content to blogger clients and recently, I’ve had a few tell me they’ve never heard the term. When I explain what it is, they are usually ITCHING to find places to pull PLR content. Because so many have asked me to share it here, I’m going to define PLR content and tell you how to use it to grow your blog. What is PLR Content, White Label Content, or Ghost-Written Content? It is NOT the same as ghostwriting or ghostwritten content. A ghostwriter pens only for a single source and project (or article). That writer may not sell the same content to another buyer. It’s also NOT the same as “exclusive” content created for sale by bloggers, freelance writers, or virtual assistants. That content will only be sold to a single buyer who can put their name on it. Note: When you hire a regular contributor, content can be PLR or it can be content created by person X for blog Z. Your exclusivity rights in this instance will need to be discussed (and put in writing) with your contributor. Kitchen Bloggers – I really love this site and not a single site I run is a food blog! The name is narrow but the content is not. You can buy packs on green cleaning, growing your own garden, comfort cooking, or any number of recipes, tips, and packs. I’ve gotten nearly 80 pieces of content for less than 35 cents each (CENTS! ), so it’s one of the most cost-effective sites I’ve found. 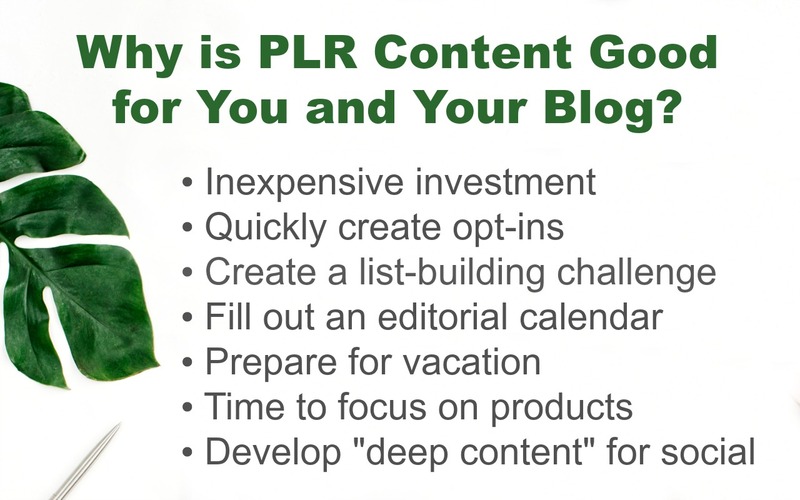 If you want to learn how to use PLR content to grow your blog, consider preparing some content for spring and summer. Check out the Picnics, Patios, and Parties Package. Read through it and then come back here and tell me how many ideas you just got for summer content! All Niche PLR – Topics on this site vary from life-hacks, business, family, and more. 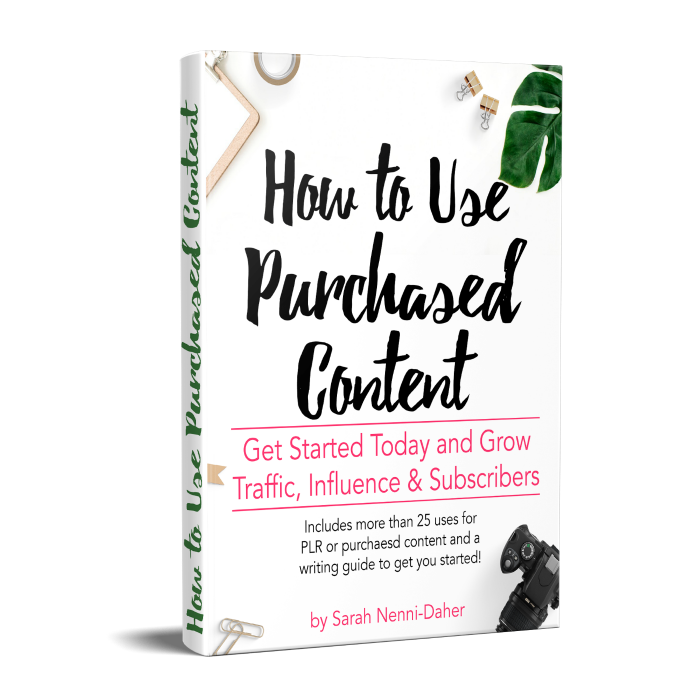 You can also get a coupon for 50% off your first product so you can learn how to use PLR content for blog growth on the cheap! There are also Facebook groups I use for PLR content from virtual assistants, freelance writers, and bloggers selling articles they aren’t using on their own sites. Make sure your niche and other articles within your blog match up with what you’re purchasing. If sold in packs, they breakdown the list of articles, reports, bonuses, social prompts, and additions within. Purchase content you can link within your own content, use for on-site roundups, and attract shares / links from others within your niche. When considering buying content, think about off-site uses for PLR content. For instance, I advised a client to run a series on one of her social media accounts which made her hundreds in affiliate sales. She spent $19 on the list of tips and combined an Amazon product with an affiliate link to earn. Can you quickly create an email challenge to build your list and help segment a portion of your audience? If you want to give a gift to your subscribers or social media followers, you can do so quickly by altering pre-written PLR content while adding in existing, familiar resources. When you are learning how to use PLR content for your blog, pay attention to usage. If the individual item doesn’t have terms listed clearly, email the author or fill out the contact form to ask. 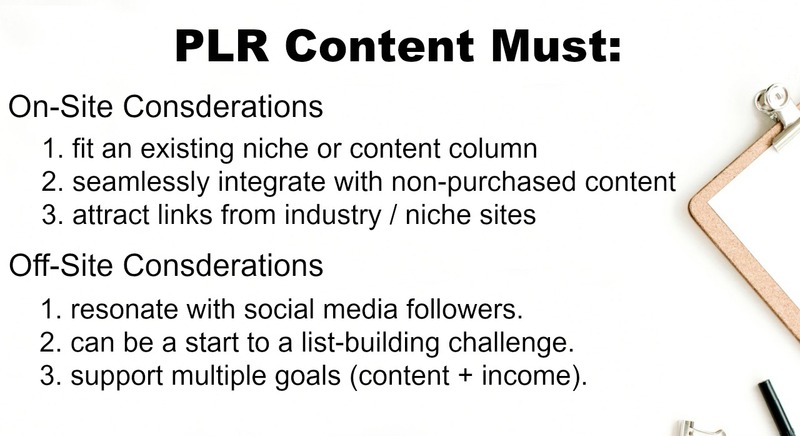 You’re never going to use the articles exactly as they are, but there are rules outside of the individual sites selling PLR content. For example, you cannot use PLR content ‘as-is’ and sell the book on the Kindle platform. You CAN rework that content into your own voice, however, and create a product to sell on Amazon. That is a distinct difference which can earn you a great deal of income. Never use the articles you’ve purchased verbatim. Your readers can catch on quickly that it doesn’t ‘sound’ like you. Besides, the PLR content is sold many times, so changing them is necessary. Read the entire offering. If you purchased a bundle, read through all articles. Identify what you like and dislike about each. Remove any sections which don’t fit for you and make notes on what they are missing. Create a plan for the content. Rewrite the articles, just as if you were writing from an outline you created. Link your existing articles within the content, add additional prose, personality, and formatting to fit your site. Add to your editorial calendar for your site, use as a social media series, or promote your products using them as starters. Purchase a pack of tips or “Top X You Should Be Doing for Y” packs and turn them into a challenge or drip campaign to build your list. I always recommend keeping notes on where you purchased the original content just in case someone brings an issue forward. I like to use OneNote to document any purchase, but many use a spreadsheet. This is the most popular PLR content tracking spreadsheet (free with opt-in). Even when content comes with images, I prefer to use my own. The only time I don’t is when I’ve purchased exclusive content (mine only) or semi-exclusive content (prepared images are sold only once). Learn how to use PLR content to grow your blog. 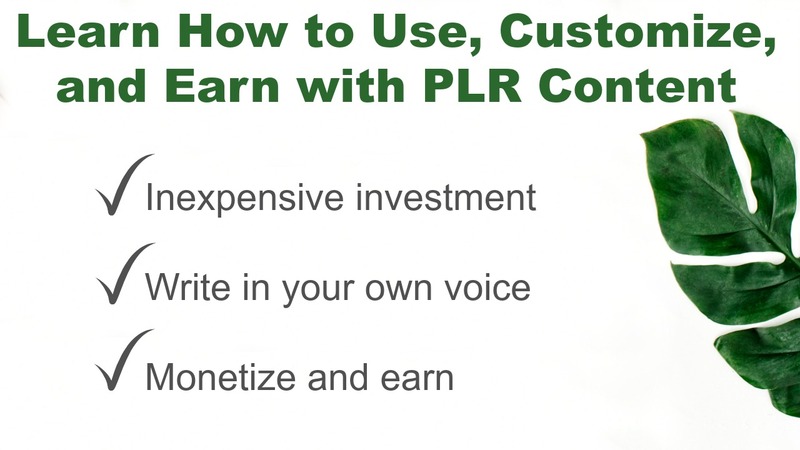 Income from your own products, affiliate partners, and even converting social followers into fans are all reasons for you to use PLR content. Your turn: do you use purchased content? If so, have you tried using PLR content? Sarah, I never ever read one of your articles without learning something and this article is no exception. I had never heard of PLR before this article. I have always been afraid of plagiarism but this is a lightbulb moment for me. How great to have help coming up with ideas and having filler info for my articles. I did an awful job launching my first book but I may re-work and re-launch using PLRs. I just cannot thank you enough. I was falling down a rabbit hole and feeling uninspired about my blog, but you have infused new excitement for me. Thank you. I just got a bundle this week from Kitchen Bloggers that I am going to build on to make an e-book. Then I will use a small version for a teaser to increase my e-mail subscribers. Trish’s idea for how to use the bundle, not mine! I was just going to use it to build my list. I have bought some PLRs in the past that were awful! I had to spend twice as much work making them usable as I would have to create the post from scratch. So, I never bought from them again. If you recommend a company, I know they will provide good content for my readers. Oh so true, Audrey! For a while, PLR content sites were popping up everywhere and the quality was horrid! That’s why don’t recommend just searching for something – I always ask my fellow bloggers if I come across a new site. How is the Kitchen Bloggers’ content you got? Trish is a great content provider for many of my clients. Let me know when your ebook and optin are ready!! This is the first I’ve ever heard of this in the 5 years I’ve been blogging! 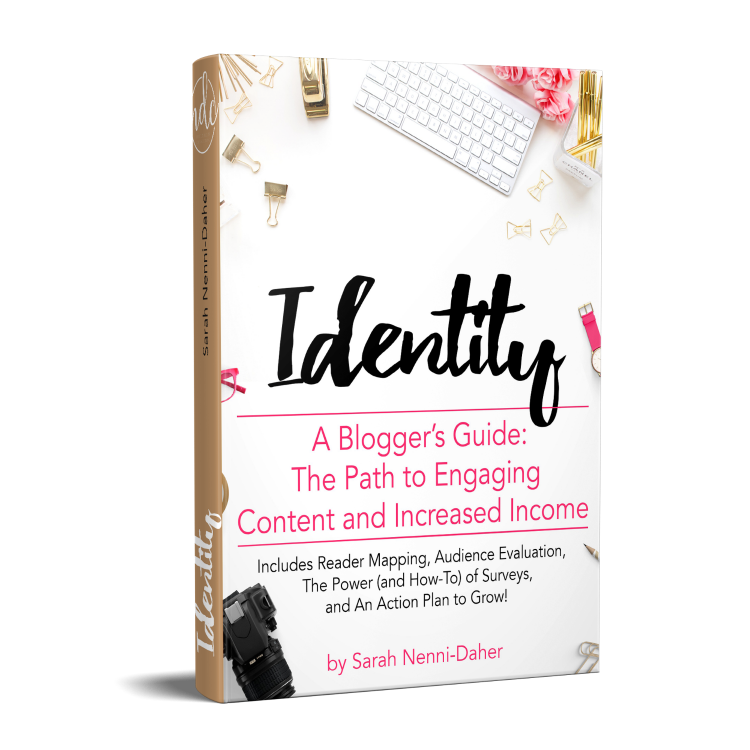 I think you just SERIOUSLY helped me figure out how I was going to introduce new content to my blog! I’ve been struggling with finding the motivation to keep writing my parenting articles AND coming up with a whole new series of content. Thank you for this! Wow! You are a genius and I love you!! I have never really consider doing this, but it makes so much sense. I am just happy to have two contributors right now! And I do sometimes use guest posts from random people who email me (with editing done to the content, etc). But to buy it is pretty smart too. Love the idea of using it for email lists and other things too! My favorite way to use it is as tips or bonuses for my original content. And because so many bloggers are focusing on Facebook currently, PLR content would be a great way to avoid losing so much of that hard work in summer. Ahhh this is brilliant! I literally have a stock of PLR that I never used that can be made into opt in and lead magnets. How have I never even thought of that. I used PLR as “writing prompts” or outlines that I would completely rewrite. When I started working more sponsored content, I stopped using PLR as much. I need to put this on my to do list. Using PLR content for blogging is definitely something that seems ‘lost’ these days. We all go to the VAs or Facebook groups directly but there is such a gold mine of content out there. Using purchased content as an outline is great if you’re writing content for your site but if you’re just sharing on social, branding it into bite-sized chunks can really win with an audience. Thank you so much for these articles! They help me understand things so much better! You’re welcome, Echo. The one constant in content marketing is change, so staying on top of things like using PLR or purchased content can really help us to grow our sites and followings. uses, and a guide to rewriting. Your free guide is on the way.